In addition to their function as bedding, quilts also served as records of family or community history, observations of surrounding landscape, and documentation of life cycle events such as births and marriages. Throughout history, women and sometimes men have used the art of quilting for many diverse purposes: to keep warm, to decorate their homes, to express their political views, to remember a loved one. Made by hand -- often collaboratively -- using familiar materials such as scraps of clothing, quilts are personal and communal, aesthetic and functional. The lessons in this unit are designed to help your students recognize how people of different cultures and time periods have used cloth-based art forms to pass down their traditions and history. Quilting continues to be largely a home-based form of art engaged in primarily by women. Heighten your students' awareness of how quilts have reflected and continue to reflect the lives of the people who create them, and of how quilts record the cultural history of a particular place and time. This theme of Friendship Quilts and Family Record Quilts contains two separate lessons that can stand alone or be taught in conjunction with one another. For a related K-2 lesson on story quilts, see the EDSITEment lesson plan Stories in Quilts. If your students explore the past through their own family history and ancestors, this unit could be used as a tool to focus on those aspects of your curriculum. You can also introduce your class to the idea of "theme" and help students recognize how quilts represent such themes as family love, passing down of memories from one generation to the next, and sharing among friends. What is a quilt, a friendship quilt, a family record quilt? What elements make up a quilt? How are family and community traditions represented in quilts? Explain what a quilt is and describe some of the historic purposes and uses of quilts, such as friendship and family record quilts. Identify elements in quilts, such as colors, shapes, patterns, and symbols. According to an essay on the EDSITEment-reviewed website Women of the West Museum, the blocks on the Friendship Quilt depict images and phrases that reflect cherished values and beliefs current at the time and place of its creation. To see the Friendship Quilt, go to the Women of the West Museum website, and, from the homepage, go to "Exhibits," then to "Collaborations: Drawn Together," and click on "Quilts." Each of the blocks in this quilt was created by one woman. The intended recipient of such "group" quilts was often a bride or someone moving from the community. What made a quilt an especially appropriate gift on such occasions? In the 1800s women commonly formed quilting groups. Their quilts offer clues to the nature and experiences of western migration and to the ways in which women gathered for social, artistic, and practical purposes. Quilt making and the quilts themselves served various purposes. In addition to their function as bedding, quilts also served as records of family or community history, observations of surrounding landscape, and documentation of life cycle events such as births and marriages. Though there have been male quilters, women were usually the ones who created quilts and who attended quilting bees. The essay Why Were Women So Important on the Frontier?, on the EDSITEment-reviewed website At Home in the Heartland Online, gives an explanation as to why: "Women were responsible for raising children and taking care of the home. Typical household chores, such as doing laundry or preparing a meal, were often as labor intensive as farming. Women helped with all the farm work from planting crops in the spring and helping to harvest them in the autumn to caring for the cows, chickens, pigs, horses and other livestock. In the spring, after the wheat or corn had been planted, a man might leave for weeks or months to go hunting or travel downriver to trade in New Orleans, leaving his wife and children to care for the family farm." Many outstanding quilts from the mid-19th century marked a special occasion. Some were composed of squares resembling the pages of a sketchbook, scrapbook or family album; others were signed like the pages of an autograph album. This activity could fit well in a unit in which students are studying families in general and/or looking into the history of their own families. Spend some time in advance of this lesson talking about family traditions to familiarize your students with the term and concept and to allow them to see the range of diverse personal and cultural traditions their own and other families have developed. Establish an anticipatory set when beginning each Activity on quilts. Read aloud any of the books recommended below, display an actual quilt, or invite a local quilter to demonstrate. Encourage students who own quilts to share them with the class. However, because quilts can be valuable family heirlooms, exercise care in allowing students to touch and work with quilts brought from home. Sharing quilts offers a good opportunity for parents to come to class to share family stories and to help monitor appropriate handling of quilts. An interesting account of a quilting bee and the accompanying festivities, written by Mary Eleanor Wilkins Freeman, may be found on the American Studies @ The University of Virginia website, a link from the EDSITEment resource Center for the Liberal Arts. Though of most interest to the teacher, excerpts may be adapted for use with students. Detailed background information about quilting groups can be found on the EDSITEment-reviewed website Women of the West by going to the "Exhibits" section and clicking on "Collaborations: Drawn Together," then on the link to "Quilts." If possible, obtain the book The American Quilt: A History of Cloth and Comfort 1750-1950, by Roderick Kiracofe, Mary Elizabeth Johnson (contributor), and Sharon Reisendorph (photographer) (Clarkson Potter, 1993; ISBN 0517575353), which contains many large photos of quilts of every kind. If possible, center this lesson around one or more authentic quilts in the classroom, to give students the opportunity to see how a quilt is constructed (the stitching, squares, stuffing and so on). How is a quilt different from a blanket? It is like two blankets sewn together with padding in between. The stitching that keeps the padding in place creates a pattern that invites further decoration. This decoration can employ elements such as color, pattern, symbols, and narrative. If it proves impractical to bring a quilt into class, use Quilt Image #21, available online via a link from the EDSITEment resource Center for the Liberal Arts, or images from one of the recommended books. Ask the class if anyone has a quilt at home. Encourage some discussion about those quilts. How are they used? Do any of the students use a quilt as a blanket or have a quilt hanging on the wall at home? Show students the quilt(s) or quilt image(s), and have them describe what they see: How many different kinds of cloth are in the quilt? Do they see some of the same cloth in different places on the quilt? What colors have been used? Are there objects on the quilt -- people, animals, flowers, baskets, etc.? How many? Where does the quilt feel thicker and thinner? Where are stitches located? Bible stories -- students might recognize the Noah story. This quilt appears to have been created by a man, Mark Rockhold Teter. D) Friendship Quilt, available on the EDSITEment-reviewed website Women of the West Museum. From the homepage, go to "Exhibits," then to "Collaborations: Drawn Together," and click on "Quilts" to see the Friendship Quilt image. As you show each quilt, ask the students to describe what they see. Have them describe the patterns and objects on each quilt, suggest why each quilt was made, and hypothesize about what kind of story the artist was telling with the pictures on the quilt. Samplers were so named because the creator uses quilt squares, or samples, made by others. Show students the image of the Friendship Quilt, located on the Women of the West Museum website. From the homepage, go to "Exhibits," then to "Collaborations: Drawn Together," and click on "Quilts." Ask what they see on the quilt and solicit their ideas as to why it might be called a friendship quilt. Fifty-six women created this quilt, possibly working together in the same room. They wanted to give their friend a quilt before she moved away. Why would they work together on one quilt? The images on this Friendship Quilt show things the women who sewed the quilt wished for one another. What did these women wish for each other? After viewing the quilt image and discussing it, give each student a sheet of paper divided into four squares to use as a quilt square template. Have the students use one block on their sheet of paper to create a quilt square representing what they wish for themselves and/or their classmates. To create the atmosphere of a quilting bee, allow students to chat and circulate a bit as they are working. As a written component for this lesson, ask students to write or dictate a paragraph explaining the section of the quilt they have created. When all the squares are done, have the class sit in a circle. The students were allowed to chat as they were working. What were they talking about? What do students imagine was going on in the room as the women were working together on the friendship quilt? If these were pioneer women who didn't often see each other and had little means of communicating, what might they have talked about? Have students display and describe their squares. After sharing their squares, have students copy their designs into the other three squares on the template. They can cut apart the four squares and keep one of their own squares. The other three are placed face down in a pile. Set up the piles for the students to pick from randomly for sampler making. Pass out another template. Each student makes a sampler by picking three designs made by other students and pasting them onto three squares on the template. Students can only trade in a square if they pick their own. The fourth square is for the student's design. When the samplers are complete, encourage volunteers to share. What wishes does the sampler show? What was it like using the work other people did to create a sampler? Was it easier than making four different designs themselves? Have the students form their four squares into a quilt by gluing them onto a larger square of paper with space in between. They can draw a design over the squares to indicate the stitching on a quilt. To view another quilt created by multiple quilters, visit Made by the Ladies Aid Society, Basalt, Colo. 1905 on the EDSITEment-reviewed website Western History: The Photography Collection. 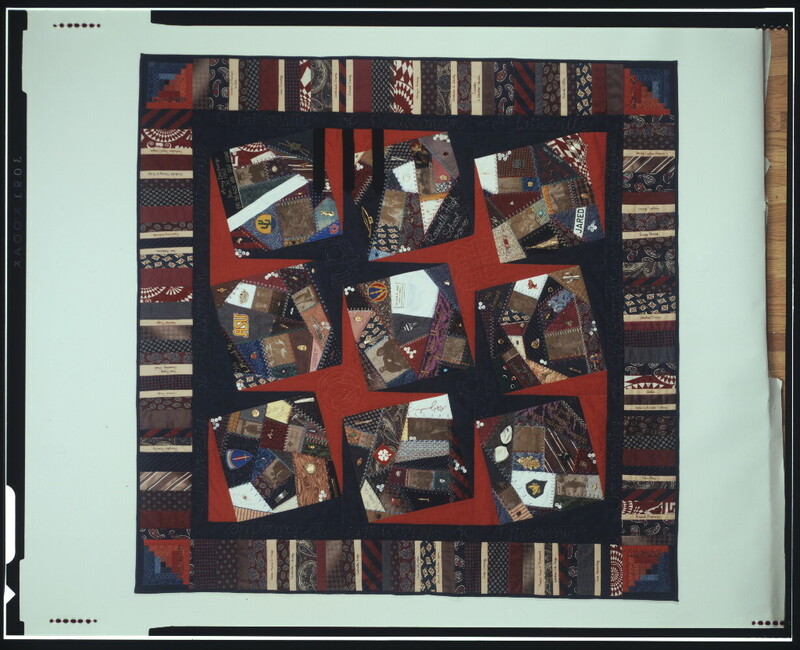 After viewing, allow students to hypothesize about the quilt's meaning. Establish an anticipatory set for the students by reading The Patchwork Quilt by Valerie Flournoy. If possible, share with the class a family tree or some other document with a family history. Discuss with students the Groom's Album Quilt made for Benoni Pearce (Pawling, N.Y., dated 1850), available on The American History Museum of the Smithsonian, a link from the EDSITEment-reviewed website Center for the Liberal Arts, and the Black Family Album Quilt (1854) (part of African American Quilting Traditions, scroll down to "Applique and Record Keeping"), available at Jamie Leigh on American Quilts, available through the EDSITEment-reviewed website American Studies at the University of Virginia. What pictures are on the quilts? If these quilts are about a family, why didn't the family members and friends use stories or photographs (daguerreotype would have been the option at the time these quilts were made) to remember things that happened in the family? Are the reasons different in the two instances? In what ways is a quilt different and maybe better than a videotape or other ways of telling about a family? Students can conduct family interviews and then use the information to construct their own album quilt. After students have conducted family interviews, they can use the information to create their own album quilt. Each student or small group can be given a piece of poster board that has been divided into four squares. In each square, draw an event or object to represent something about her/his family, either illustrating one family event or topic through several squares or illustrating four different events or topics. Ask for volunteers to share their completed family quilts and to relate the events they memorialize. An alternative would be for each student to complete one square at home about his/her family. As you apply each square to a bulletin board, students can guess what event is being remembered. If your quilt is based on a traditional pattern or an earlier quilt, what is the name of the pattern? Where did you learn the pattern? I didn't use a pattern. This quilt idea came to me in a dream and evolved as it was being made. I thought that the crazy quilt style would allow me to tell the story of my father's life and career, and to use mementos to embellish it. The pattern and the quilt uses a lot of symbolism. The quilt is done primarily in orange and blue, the colors of the university where he taught for 40 years. Since he always wore a white shirt and tie to teach, the quilt contains a shirt placket complete with buttons and a shirt pocket with his name tag attached. The quilt border is representative of a bookshelf. The border is made of pieces of my father's old ties, cut into strips, along with the names of the classes he taught cross-stitched on Aida cloth." Other techniques used include: embroidery, photo transfer, beadworks, buttons, mementos, and counted cross-stitch. How did you choose the materials used in your quilt? "My quilt evolved. The only people aware of my project were my mother and husband. Mom was a very important part of my quilt as she was the one who secretly 'borrowed' the shirts, ties, fabrics and memorabilia for the quilt. Every couple of weeks I would receive a box in the mail with more 'treasures' for my quilt. Even the day before the retirement party we were busily sewing on last minute charms. Commemoration of retirement, achievement, memory/nostalgia …"
Can the students find the things the artist mentions? An additional album quilt, Doll Bed Applique Patchwork Quilt, with description (Image only), can be viewed via a link from the EDSITEment-reviewed website American Memory. The AIDS Memorial Quilt is an example of a contemporary quilt that has elements of both family and friendship quilts. It was created by a different type of quilting bee, with panels sewn by people throughout the U.S. that serve as a record and remembrance of loved ones who have died, in a fashion similar to memorializing family members and events in the family record quilts. You can use the children's book A Name on the Quilt: A Story of Remembrance by Jeannine Atkins and Tad Hills (Illustrator) (Atheneum, 1999, 32 pages, $16.00 Hardcover, ISBN: 0-689-81592-1, Reading level: Ages 4-8) to introduce the AIDS Memorial Quilt as an example of a quilt that preserves history and helps us remember someone. The website The AIDS Memorial Quilt, located through the EDSITEment-reviewed website Smithsonian Art Museum, offers information on the history and purpose of the AIDS Memorial Quilt. Invite a quilter to your classroom. Invite family members of students to bring their quilts to class for "show and tell." Where quilting is still a tradition, students can also conduct interviews about quilts in their homes. Study cross-cultural connections regarding quilting using quilts from other countries or cultures. One example is the European- and African-influenced quilts on Southern Quilting Traditions, a link from the EDSITEment resource Center for the Liberal Arts. Use the book The Keeping Quilt by Patricia Polacco to introduce an activity in which students make a 'keeping quilt' and hang it in the school. Read aloud from The Keeping Quilt, and then ask students to write about a memory. For younger grades, the children can talk about their memories, and the teacher can write down a list of memories on the board. After writing/talking about their memories, the students should each draw a picture related to that memory. The picture is then traced onto vellum paper and colored with fabric crayons, along with the child's name. Finally, the drawings are ironed onto a large piece of material that can be stuffed and backed as a 'keeping quilt' for the school. In some communities, quilting clubs can assist with classroom projects. Such a group may be able to help your students create a real quilt. A discussion of quilt making in the classroom as well as helpful tips can be found at America Quilts: Quilts in the Classroom, available through a link from the EDSITEment resource Africans in America. Through the EDSITEment-reviewed website American Memory, students can view many additional images of contemporary quilts. Each of the images is accompanied by the artist's explanation of the process involved in the making of the quilt, as well as the quilt's meaning. This collection also includes a glossary of quilting terms that could be useful for understanding how a quilt is assembled. 59 Hoover Schools, a special section of the EDSITEment resource Digital Classroom, features a quilt from the Hoover Presidential Library, depicting the 59 schools named for Herbert Hoover. Your class might be interested in viewing these student-made quilts, and might also like to design a quilt square for their school. Perhaps there are other schools around the nation with the same name as your school. The recent film "How to Make an American Quilt" (1995), based on Whitney Otto's novel of the same name, has several scenes of women sitting together to stitch a quilt. Students might gain a visual image of what is involved in quilting by viewing brief clips from that film. Coerr, Eleanor. The Josafina Story Quilt. New York: Harper & Row, 1986. Lyons, Mary. Stitching Stars: The Story Quilts of Harriet Powers. New York: Aladdin Paperbacks, 1997. Turner, Ann. Sewing Quilts. New York: Macmillan Publishing Company, 1994. Illus. by Thomas B. Allen. "Pioneer girl sees pieces of her life sewn into quilts that she, her mother and sister create." Flournoy, Valerie. The Patchwork Quilt. Illustrated by Jerry Pinkney. Dial Books, 1985 (ISBN 803700989). "Using scraps cut from the family's old clothing, Tanya helps her grandmother and mother make a beautiful quilt that tells the story of her family's life." Hines, Anna Grossnickle. Pieces: A Year in Poems & Quilts. Johnston, Tony and Tomie DePaola. The Quilt Story. Paul, Ann Whitford and Jeanette Winter (Illustrator). Eight Hands Round: A Patchwork Alphabet.